Over the weekend I had a chance to review the Jawbone Prime Bluetooth Headset. Aliph’s Jawbones headsets have always been rated among the highest-rated Bluetooth headsets for awhile now so I was kind of anxious to try this highly rated Bluetooth headset out. So without further ado let’s take a look at what’s in the box. The packaging of the box was very nicely done as to be expected. All of the accessories are in an exposed front-facing manner. Everything you need is nice and neatly packaged in the box. 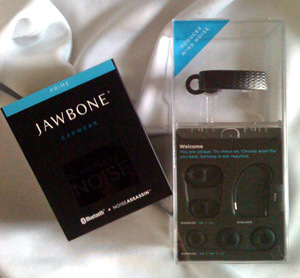 “Jawbone PRIME has even better background noise elimination than the previous generations. NoiseAssasin™ 2.0 delivers an order of magnitude improvement in the noisiest environments (6 to 9dB) extracting even more noise while keeping the user’s voice natural. I decided to test the PRIME’s voice detection and background noise elimination at my kids soccer game. During the middle of the game I pulled out the PRIME and made a few calls. The PRIME delivered as expected, the recipients of the calls could faintly hear the cheering and hollering in the background nor could they hear the wind that was in the background. The recipients of the calls were shocked to find out I was talking to them on a Bluetooth Headset. On my end the call was crystal clear as well. I would say of all the Bluetooth Headsets I have owned this one was by far the better when it came to call quality and clarity. 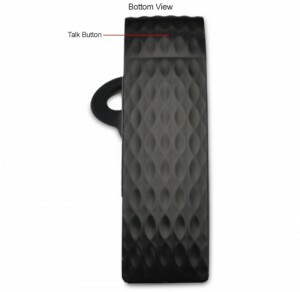 The Jawbone PRIME like its predecessor the Jawbone 2 is slim and lightweight measuring 2.1 inches long by 0.5 inches wide by 0.5 inches thick, the PRIME is small enough to be discreet when worn. 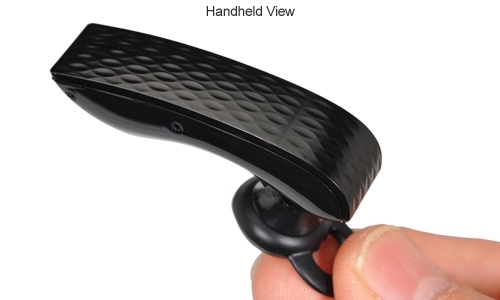 The Device is very lightweight as well weighing in and a petite 0.36 ounces so you barely even notice you have it in your ear. The PRIME sports a rather elegant dimpled loop pattern on the front giving it a very fashionable design. The buttons on the prime can be a little difficult to find because they’re almost invisible. 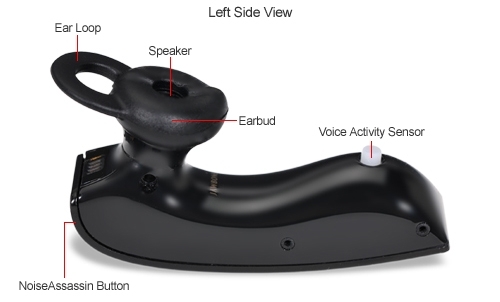 There is a slight dip towards the top third of the headset which hides the multifunction talk button, pressing the very top of the headset will activate the NoiceAssasin or volume button. Speaking of volume there is only one volume button which I was a little disappointed in so you will have to cycle through the volume levels a couple of times to find the perfect setting. Flip the headset over and you will find a soft squishy rubber earbud covering the earpiece. The earbud was very comfortable and I found using the large size earbud cover the PRIME felt secure and snug in my ear. 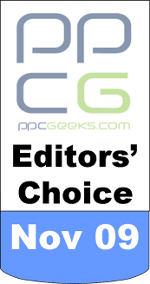 The earbuds were probably the most comfortable I have used with any other headset. I give the design on the earbuds and comfort Two thumbs up! There’s also an optional ear hook if you prefer, but I found that I didn’t really need to use it. Towards the back of the PRIME is a tiny nub that acts as the Voice Activity Sensor, which is used to amplify your voice. I found the inside contours of the PRIME followed my face perfectly in a comfortable manner. The PRIME also comes in several different colors also called “EARCANDY”. 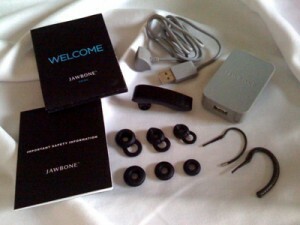 I paired the Aliph Jawbone Prime up with my Sprint HTC Touch Pro 2 in less than a minute. Pairing was quite easy and effortless. The PRIME comes with a very detailed instructions manual on setting up and using the device. I tested the device in several different settings, at the mall, in my car, at home and at my kid’s soccer game. In every environment all the callers said I sounded loud and clear, with a natural sounding voice and volume and background noise was minimal in each environment. 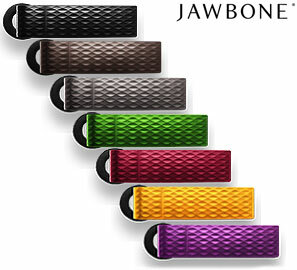 The Jawbone Prime has all the typical calling features for Bluetooth headsets such as answering, rejecting, and ending calls; voice dialing support; call waiting support; battery status indicator; call mute; last number redial; and it has multipoint technology that lets it connect up to two devices at once. It has a rated talk time of 4.5 hours and a standby time of 8 days. The bottom line is the Aliph Jawbone Prime is a great Bluetooth headset that combines high style with high performance. The device packs some innovative design and technology into a small device. 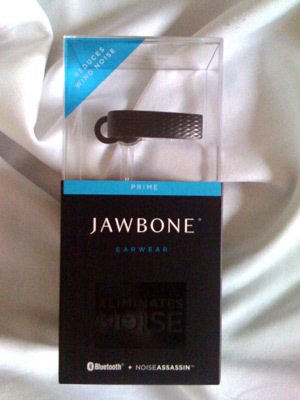 To read about the Aliph Jawbone Prime or to order from our store follow this link.